From the theatrical release poster for The Birth of a Nation, 1915. Photo via Wikimedia Commons. A century ago today, D.W. Griffith released a controversial new film, the first American blockbuster. 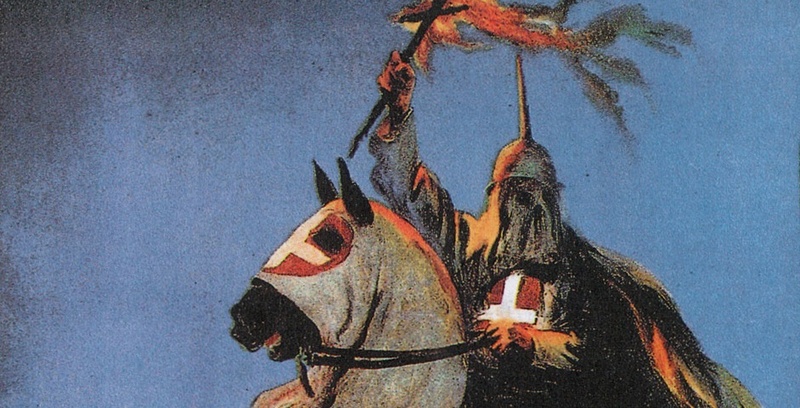 The Birth of a Nation depicted the aftermath of the Civil War and the rise of the Ku Klux Klan, and inspired calls to ban it in cities across the North. In “The Regulation of Films” (May 6, 1915), Oswald Garrison Villard, The Nation’s publisher and soon-to-be editor, came down on the side of light censorship of a films, which he described as a dangerous new medium, but in 1920, Villard had changed his tune: that year, he helped found the ACLU. Wherever it goes, the “Birth of the Nation” [sic] film arouses widespread indignation. In Boston the excitement has been at white heat, because of a series of hearings before Mayor, Governor, and a committee of the Legislature. A judge has been found with authority and courage enough to cut out the most objectionable scene. The press has been full of arguments for and against the film and the proposed legislation. Many clergymen have preached about the play; and ex-President Eliot, speaking in a Cambridge church, was one of those who protested against its falsification of history. Never before have the colored people of Boston been so united and determined, or appeared to better advantage. [Yet] the play continues to do its devilish work of misrepresentation and of arousing race hatred. The truth is that this new means for public amusement and education has brought with it grave perils which we are only just beginning to realize, for side by side with its educational possibilities are the dangers of unrestricted propaganda.